There are a lot of options in the SV3Power lineup, and it can be confusing to sort out what you need. Any car that will be driven on the street needs four basic components: a header (or manifold), a downpipe, a catalytic converter (or test pipe), and a muffler. This page will help you select the right combination of parts for your car. There are two basic exhaust system formats: NA (meaning Naturally Aspirated) and SC (Supercharged). NA and SC use their own specific flanges at the downpipe outlet, cat, and muffler. So if you choose an NA-style system, those three components must be NA-style; the same goes for SC. Begin by selecting your engine. Click the link for your engine type to view the header/manifold options that will work for you. 4A-GE 16V naturally aspirated: Use NA-style components. Click the link following your exhaust manifold or header to view the corresponding downpipe. 4A-GZE 16V Supercharged: Use SC-style components. Click the link following your exhaust manifold or header to view the corresponding downpipe. 4A-GE 20V AE101 Silvertop: Use NA-style components. Click the link following your exhaust manifold or header to view the corresponding downpipe. 4A-GE 20V AE111 Blacktop: Use SC-style components. Click the link following your exhaust manifold or header to view the corresponding downpipe. 7A-GE 16V: Any reasonably strong 7A-GE should use SC-style components. Click the link following your exhaust manifold or header to view the corresponding downpipe. 7A-GE 20V: Any reasonably strong 7A-GE should use SC-style components. Click the link following your exhaust manifold or header to view the corresponding downpipe. Any NA-style exhaust system: Choose any NA-style OEM or SV3Power muffler. Any SC-style exhaust system: Choose any SC-style OEM or SV3Power muffler. That should give anyone the basic layout they need. 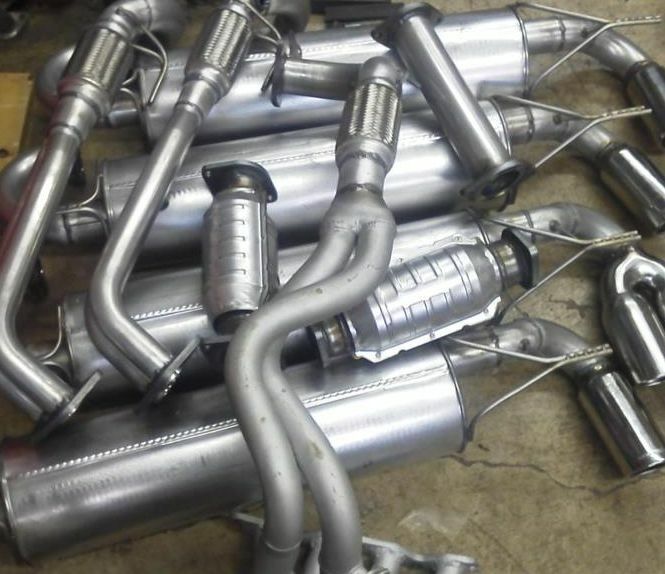 There are other options, such as different oxygen sensor fittings and muffler tips, but they are mostly a matter of personal preference. As always, let us know if you need more assistance! I just received my muffler and parts and had a few questions about them. Could you email me so I may have them answered? I don’t see an email address for you on the site. Thank you. Email sent! Be sure to check your spam folder, as some spam filters are more finicky than others. I am looking for a complete exhaust system for my stock AW11 4AGE without a CAT. Thanks for the inquiry. I will be adding a cat-back muffler to the catalog as soon as I can. Using a catalytic converter is always suggested on any car driven on the street, but I do offer test pipes for track-only cars.